So wonderful that Oriole now swims freely with other seals!! I see what you mean, you can see the dehydration just looking at the poor little thing. Gitchi Miigwetch for giving her another chance at life! Booni, it's great that you have these photos to learn from. We learn by doing, to see all the information available to us. It took several bird rescues, with the rehabber on the other end of the phone asking "is it thin?" - right, let me check the keel ... before I remembered to include that in my assessment. Thank you, sweet Oriole, for helping us to learn. Thank you, Booni! They will be executed in "the name of research" boy that's a stretch! From Island Wildlife's FB page!! Remember our petition last September that garnered 140,000 signatures and started the campaign that saved Zac & Mika, the two Harp Seals that were slated for certain death at the Aquarium des Iles in the Magdelan Islands? Well this spring, the Aquarium’s application to capture and display two more seal pups was REJECTED by the Ministry of Natural Resources! Aquarium Coordinator Alice Stone said that because the seal pups generated revenue, they must now be creative and find new sources of income and educational awareness. Well, I am glad their application was rejection because of the terms they use the seal pups. One season and you are useless to us and euthanized. Heartless to put it mildly. I hope they are creative and come up with better ways to find income than to treat the marine resources in such temporary cast off manner. 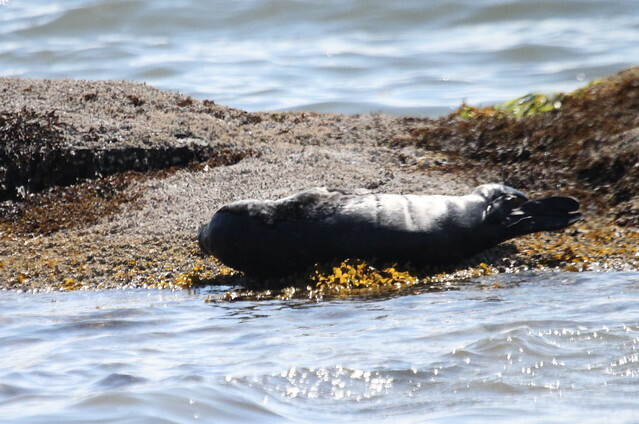 This afternoon I got a call from Marielle from island Wildlife Natural Care Centre... She told me that someone had called from Phipps Point to report a seal pup that seemed to be in distress. The caller had sent Marielle some photos and described the little seal's behaviour, and Marielle had decided that someone needed to capture him or her. 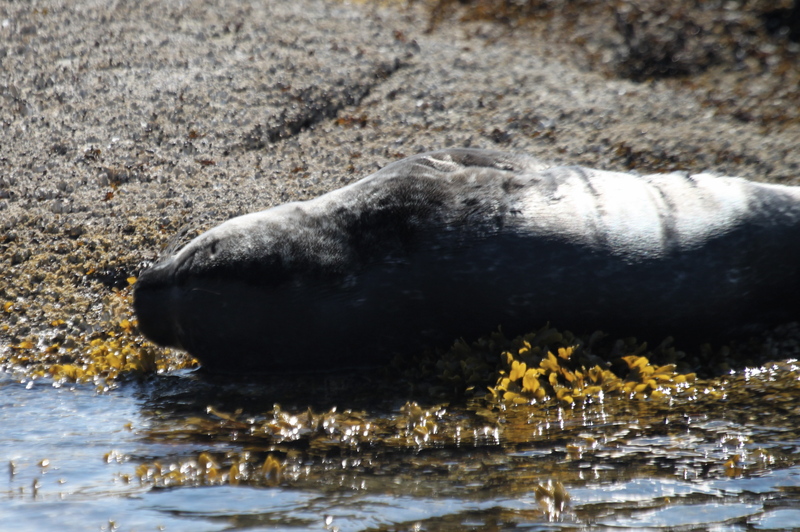 "The seal pup is on a rock, a short distance off shore. Do you have a kayak?" Marielle thought two kayaks might be better. If the little seal took to the water, it would be very difficult to catch him. So I phoned a friend who, like me, tends to keep her boat on top of her car on days off so she can go paddling at the slightest provocation. Was she game for a little adventure? She was! Thinking about the area, though, I had it in the back of my mind that swimming or wading might be easier. And when I got on site, it was obvious. The rock was close to shore and the water between was shallow. Here's a photo I took while I waited for my helper... Focusing on the rescue and not thinking about good photography. He's certainly not as emaciated as Oriole was, thank goodness. But Marielle thinks that this may be the same seal pup that Booni had gone looking for on Saturday. People were worried about him even then. He had been approaching humans, a sign that his mother is nowhere around. We had both come prepared to swim. We gloved up, I took the net, my helper took a towel. We could have waded, but that way we would have been large, noisy and clumsy. So we swam slowly, silently in the shallow water, with just our heads showing, net and towel under the water, hoping to look more like seals than like humans. She faced the little seal while I came from behind, each of us blocking his access to open water. He stared at her - and that was what I had hoped for. She thinks he never saw me coming. The net is like a long, long arm... And it was over him before he even moved. The people on shore had stood respectfully back. On my signal one of them brought the container I had prepared on Marielle's instructions. 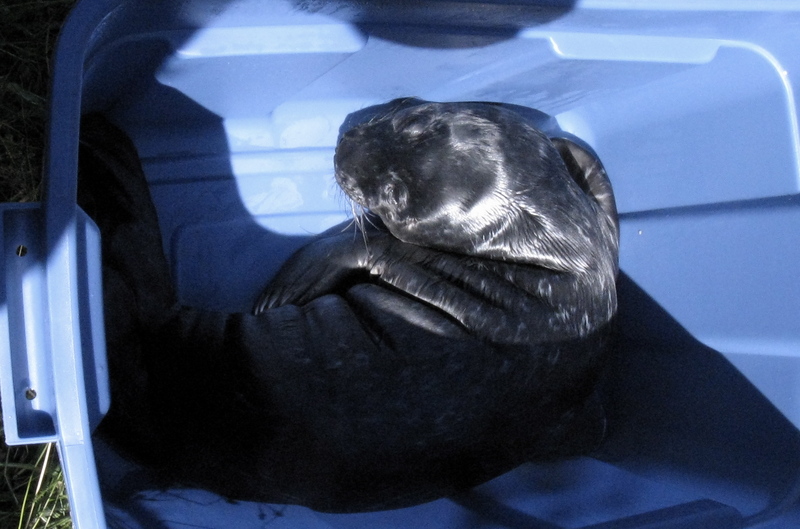 My wonderful helper brought it across the water, we tipped the seal pup into it, and that was that. 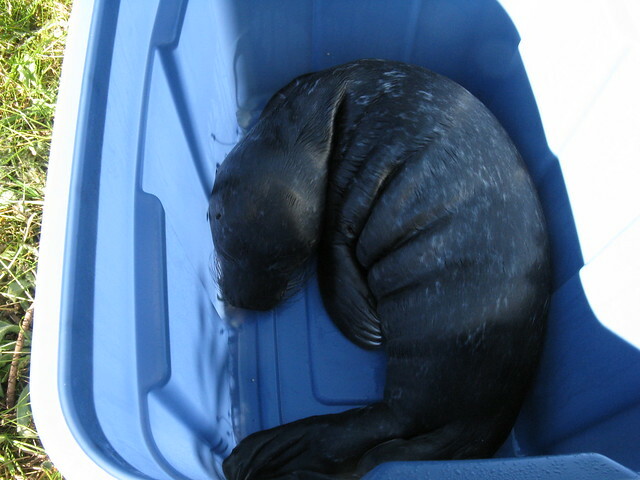 Seal pup in his tub, back at my house, waiting for transport. Marielle had asked for photos so we briefly got him out of the shade for a clearer view. Meanwhile Marielle was arranging for trnasport. I phoned her to report on our progress, and that's when I learned that I was going to meet Norm Snihur again. Marielle gave me Norm's ETA as 6:38, which sounded impossibly precise. She cautioned me that Norm is always on time. Nope. He was 6 minutes early. I was so glad to see Norm again. 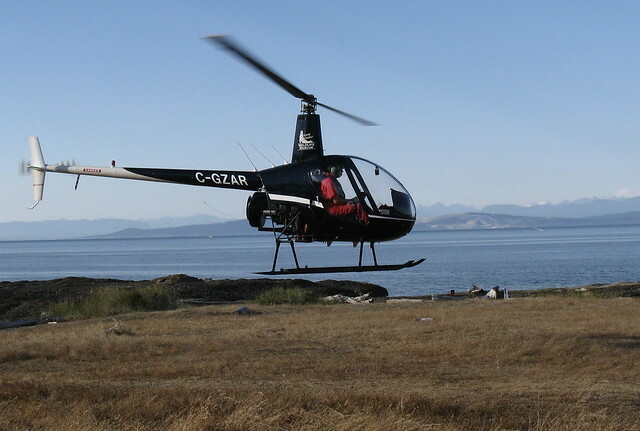 He's landed on Grassy Point several times to pick up injured eagles and seals from us, and get them to wherever they needed to go. He said that the numbers are picking up: he's to transport two more seal pups from Lasqueti Island tomorrow. 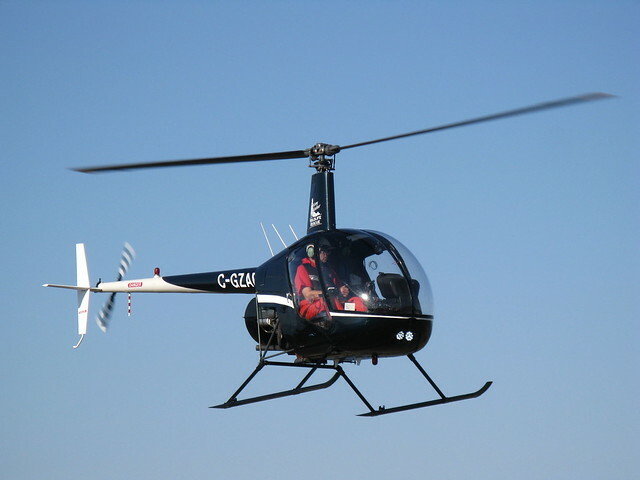 Meanwhile, a crowd had gathered, and Norm graciously allowed people to have a closer look at his cute little helicopter. Then it was time to say our goodbyes, and our flying angel took off, with his furry passenger on the floor beside him. So by now, the little seal should be safely on Salt Spring Island. My goodness Wren your account of this wonderful rescue gave me shivers, fantastic that you & your kayak buddy were available to go rescue that baby seal. Well done, thank you. Wow....WTG Wren and helper! 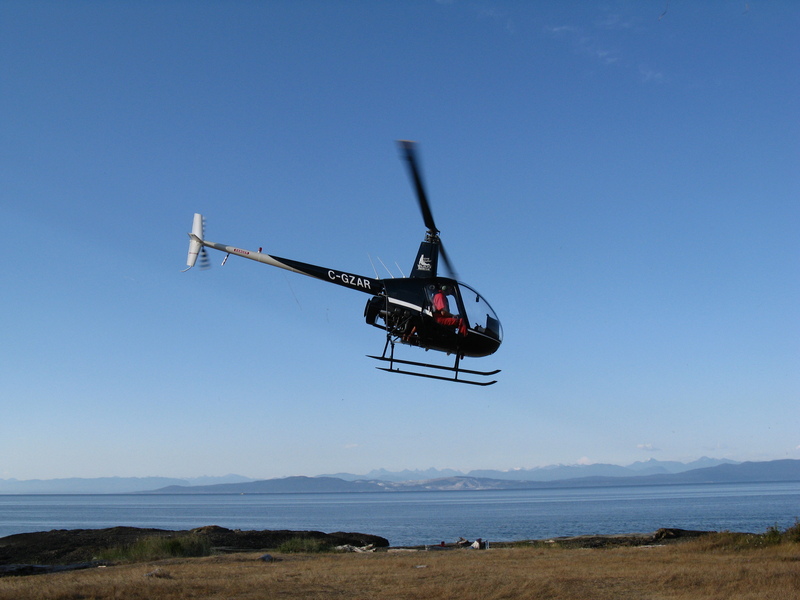 Norm is like a little orange angel in that copter! Thanks for pics and story and making this rescue!!!! Good luck baby seal! What a great plan executed to capture this seal without scaring it to a chase and using up precious calories it didn't have. Bravo!! Marielle called me this morning with an update. 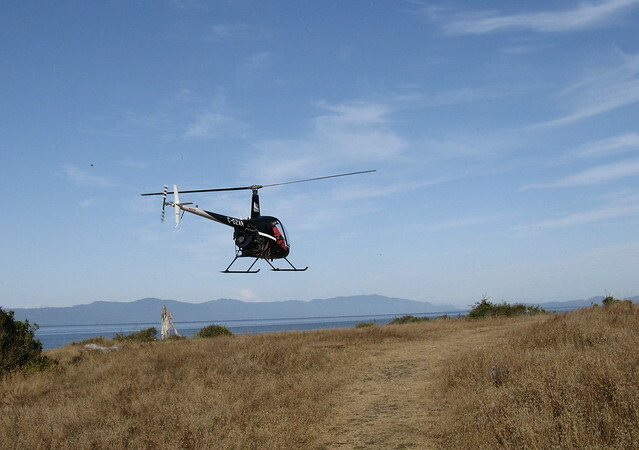 She said the little seal is uninjured, was very dehydrated, and somewhat overheated; this last she attributed to the transport on such a hot day. It sure was warm, even in the shade. I'm working on a better way to cover the box and still let more air through. Something in the line of the netting windows Norm has sewn into his transport bag, maybe. Anyway, it sounds like that little one has a good chance of survival.